Have you decided where you are jetting off to these December holidays? Not only is December a time to forget about the office, but it is also a time when you can wake up late, spend quality time with your loved ones, and just live in the moment. While you could book accommodation in coastal cities and towns such as Durban, Cape Town, Knysna, or Plettenberg Bay, you could also visit one of the Eastern Cape’s most prized getaway destinations – Graaff-Reinet. Nestled in a bend of the Sunday’s River, at the foot of the Karoo Natural Reserve, you will find the historical town of Graaff-Reinet. A haven of peace, fun, and adventure set in a tranquil environment, Graaff-Reinet is the fourth oldest town in South Africa. Renowned as the “Gem of the Karoo” and popular with South Africans as well as tourists from around the world, accommodation in Graaff-Reinet is as varied as the attractions that can be found in the town. From luxury 5-star hotels and B&Bs to self-catering guest houses – whatever type of accommodation you can imagine can be found in this beautiful town. While there are many places to stay that vary in price and style, if you are looking for luxury accommodation that offers value for money, stay at KarooRus. Situated in the heart of Graaff-Reinet, KarooRus is proud to offer amongst the finest and most affordable accommodation in Graaff-Reinet. At KarooRus, we believe in offering our guests more than just comfort, safety, privacy, and great rates. 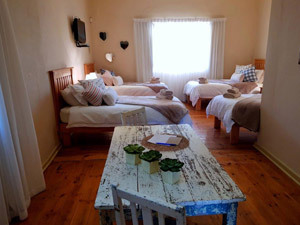 We offer accommodation ideal for large groups of friends and families, make your choice from seven stylishly decorated self-catering accommodation suites, each with wooden floors and its own private entrance. We offer guests a home-away-from-home ambience that simply cannot be compared to any hotel, and you are guaranteed to stay in comfort and luxury. At KarooRus, you can expect only the best of everything. Each air-conditioned suite is furnished with top-of-the-range linen and towels and has a luxury en-suite bathroom and modern kitchen equipped with appliances and cookware. Great care has been taken to ensure guests get top value for money. While each suite has its own flat-screen TV set, DStv, and free ADSL, our stylishly decorated suites are also equipped with an alarm system, secure off-street parking, and a spacious braai area. Great care is taken to ensure our guests feel at home in comfort and luxury, and our cleaning staff will ensure that you do not have to lift a finger while staying with us. And did we mention that you can bring your pets? At KarooRus, we love animals and are one of the few self-catering guest houses in Graaff-Reinet that welcome pets. To find out more about our Graaff-Reinet accommodation suites and great rates, get in touch with us today. With the holiday season upon us, South Africans will soon be heading to destinations around the country for rest, relaxation, and fun. From vast savannahs, rolling hills, jaw-dropping mountain peaks, and Big 5 national parks to picturesque coastlines that stretch for kilometres, South Africa offers an endless variety of places to holiday. However, if you want a combination of history, nature, adventure, architecture, art, great food, shopping, and water sports, the beautiful and vibrant town of Graaff-Reinet will keep you and your family busy for days. Pack a picnic basket and visit the Camdeboo National Park. Home to nearly 250 bird species, at least 336 types of plants, and 43 mammal species, the Camdeboo National Park is also the old home of Bushmen and as such, numerous drawings can still be found in caves and on rock cliffs. An amazing geological phenomenon, the Valley of Desolation offers stunning rock formations that feature unique cliffs and piled dolerite columns that have their origin in ancient volcanic activity. While the Uitkyk peak is a popular launching spot for paragliders and microlites, hikers and photographers are spoilt for choice at ground level. The weather may be windy, so take along something warm. For history lovers, the past is preserved in four museums that hold collections of firearms, artworks, and fossils. The richness of pre-dinosaur fossils in this region is world-renowned. Once a lush swamp-like environment that was the battleground of gigantic lizards, such as the Pareiasaurus and Diictodon, many of the dinosaur fossils displayed around the world come from Graaff-Reinet. Graaff-Reinet is home to the Nqweba Dam, which hosts a number of water sports, such as canoeing, kayaking, fly-fishing, and angling. Want to take the kids on a day outing they will never forget? Book a boat for the day and take the family wakeboarding, knee-boarding, or tubing. Located at the foot of the Sneeuberg Mountains and a 40-minute drive from Graaff-Reinet, art lovers will be blown away when they visit the Owl House, featuring the most amazing glass and concrete sculptures. If you want to spoil your family with a holiday that offers everything from beautiful views, great shopping facilities, historical sites and museums to exciting adventures such as quad biking, walks in nature, horse riding, game viewing and water sports – Graaff-Reinet is the place to visit this festive season. You can be sure you will leave wanting to return again and again.